The OASE BioPress Pond Filters can be used to clean pond water & also pass water to a small stream or waterfall. All models supplied with UV Clarifier. The OASE BioPress are cost-effective entry-level pressurised pond filters and include a built-in Ultraviolet Clarifier (UVC) for eradicating pathogens and green water (single-celled algae). 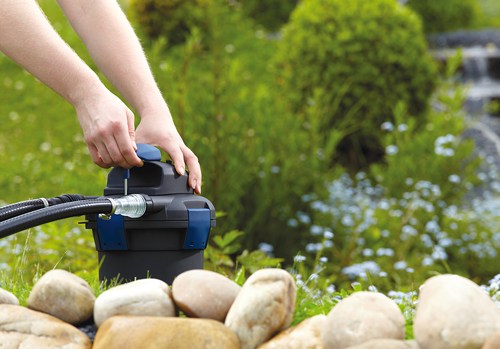 The pressurised filter housing means you can pump the cleansed pond water up to a small watercourse or feature. The BioPress filter range are suitable for ponds from 4,000 - 10,000 litres or fish stocked ponds from 2,000 - 5,000 Litres. The BioPress filter chamber houses coarse and fine filter sponges to trap large and small particles whilst housing a large colony of beneficial bacteria to break down fish waste. The UV Clarifier which is built into the lid will kill and flocculate single-celled algae which would otherwise create unsightly green water. The clumps of algae are then trapped inside the filter foams. These practical filters can be installed above or below water level and can be partially buried up to their lid to help disguise from view. The patented Easy-Clean mechanism makes filter maintenance extremely simple. Pulling the handle compresses the filter foams and debris is released which will then pass out through the filter outlet to a plant border or drain. The BioPress is available as an individual filter or as a packaged set which includes a robust solids-handling pump and are suitable for fish keeping in ponds with small hardy fish varieties and small Koi to guarantee great water clarity and condition. Choosing the most suitable BioPress Filter for your pond.